Democracy is that form of government in which the supreme power lies in the hands of the people. In a democratic country, every citizen has one vote, that can be cast in favour or against the government policy. Further, in a democracy, the response of the citizens acts as the foundation of the government. It can be in the form of direct democracy or indirect democracy. Direct democracy refers to the system in which citizens has the right to take part in the decision making process. On the contrary, indirect democracy implies a democracy in which the citizens choose their representative, to actively participate in the administration of the government and act on their behalf. In this article, you can find the important differences between direct and indirect democracy, take a read. Meaning Direct democracy refers to a form of government wherein citizens out rightly take part in the administration of the government. Indirect democracy implies a democracy in which people vote for their representative, to represent them in the Parliament. Policies Government policies are decided by the people themselves. People elect their representatives to take decisions on government policies. Legislature Whole community forms legislature. Representatives of the winning party forms government and are a part of legislature. Suitability Countries whose population size is small. Countries whose population size is large. Direct Democracy or otherwise called pure democracy or participatory democracy, is one in which decisions relating to the laws and policies of the government are taken by the people directly. It requires direct participation from the citizens of the country in day to day decision making and administration of the government. Switzerland is one of the countries where direct democracy is prevalent. In this form of government, every law, policy or bill is passed only when voted on by all the citizens of the country. Here, all the people of the government come together raises issues, enter into discussions to come up with a decision which is agreeable to all. So, the citizens of the country have a direct say in the formulating laws and the affairs that influence them. 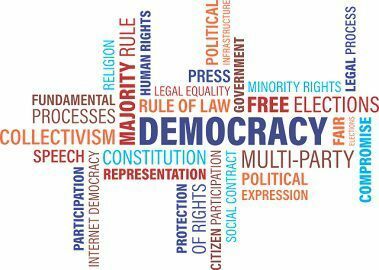 Indirect democracy or popularly called as representative democracy is the system of government wherein people choose their representatives, to represent them in the Parliament and actively participate in running the government. So, the participation of the citizens is limited in taking important decisions and formulation of policies. India is the common example of indirect democracy. In an indirect democracy, a politician is elected from each constituency who represents the people who voted for him in the parliament. It relies on free and fair elections wherein those who are currently ruling have a just and fair chance of losing. Hence, the elected politician can be removed from the office and made accountable for the work performed by them for the community. Direct democracy can be described as the system of the government, wherein the implementation of laws is possible by the general vote of all the citizens of the country. On the other hand, indirect democracy is that form of government in which the citizens of the country votes for the representatives who are empowered to decide on their behalf. In a direct democracy the decisions relating to government policies, laws and other issues, are taken by the people. Conversely, in an indirect democracy, the people choose their representatives, takes decisions on the formulation of laws and policies. In a direct democracy, the entire community forms legislature. As against, in an indirect democracy, the elected representatives of the winning party forms the government and are a part of the legislature. While direct democracy is best suited for small countries, indirect democracy is good for large countries. Direct democracy is a clear democracy that is appropriate for the countries where population size is less. However, it cannot be practised in a country with large population size, and where a decision has to be taken by crores of people. Due to this drawback, representative or indirect democracy came into being that overcomes the disadvantages of the direct democracy.